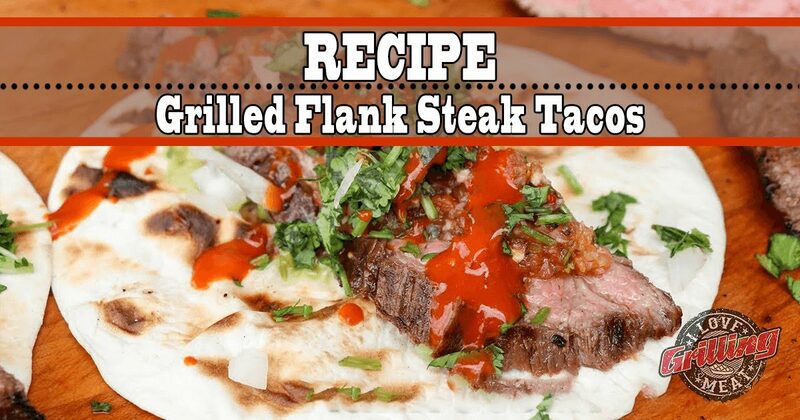 Whether it’s a birthday, the Superbowl, or your weekly family get together, these grilled flank steak tacos are so good you’ll wonder why you didn’t make these mouthwatering morsels earlier. Check them out now, you’ll thank us later. Firstly, let’s prepare the marinade. This step will enrich the steaks with great flavor & aroma in the flank steak tacos, as well as making it more juicy. Simply mix the ingredients below. Now it’s time to marinade those steaks. Place them in a large enough food safe ziploc bag, then pour in the marinade. Seal the bag, removing as much air as possible. Then gently massage the steaks through the bag to get the marinade everywhere. Marinate for at least 2 hours in the fridge. In the meantime, set up your grill for 2 zone cooking. This means one side of your grill will be directly above the heat source, while the other will be used for cooking with radiant heat. When the flank steaks are done marinating, season lightly with salt & pepper and throw them on the grill (direct heat). Sear each side for 90 seconds. Then move the meat over to indirect heat and cook to desired doneness. Let the steaks rest for 10 minutes, before slicing across the grain. While resting, heat up the tortillas on the grill for 30 seconds each. Lastly, assemble your flank steak tacos, with fresh Guacamole, chopped Cilantro, diced white onion, kosher salt, ground pepper and your favorite salsa/hot sauce.